Raw, shelled brazil nuts have a sweet, buttery flavor with a hint of coconut and a pleasingly creamy texture. Shelled Brazil nuts can be eaten alone as a snack. They are a popular nut to eat raw or roasted. Brazil nuts have many culinary uses. They’re a fantastic ingredient in desserts. They add crunch and flavor to a salad. You can incorporate Brazil nuts into main dish meat recipes or vegetable side dishes. Whole Brazil nuts are a healthy food choice for those on a gluten-free diet. 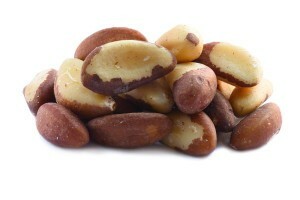 In addition to being gluten-free, Brazil nuts are also cholesterol free and sodium free. When you’re on a weight loss diet, one of the first things you look at is the calorie content of foods. Although it’s important, the calorie count should not be the sole determining factor in whether or not you eat a certain food while dieting. It’s also important to consider the amount of a specific food you need to eat in order to benefit from their nutritional value. A 1-ounce serving size of shelled Brazil nuts contains about 200 calories. However, in that 1-ounce serving, you get 8% of the recommended daily value of fiber. Fiber is a key component of a weight loss plan. That same serving size provides about 4 gram of protein and about 3.5 grams of carbohydrates. Enjoying as few as 6 average-sized Brazil nuts can provide numerous health benefits. Not only does the fiber content of this nuts aid in weight loss, it also supports the digestive system. Adding these nuts to your diet can reduce your risk of developing colon cancer and prevent bloating, cramps and gastric ulcers. Brazil nuts are also good for your heart health, skin health and your nervous system. Brazil nuts hold the distinction of being one of the best nuts for boosting your immune system. These nuts are a good source of vitamin C and zinc, both of which support immunity. The high amount of selenium in Brazil nuts is beneficial to the immune system and to the thyroid. Selenium also helps prevent coronary artery disease and various types of cancer. Brazil nuts contain beneficial levels of mineral such as copper, magnesium, manganese, potassium, iron and phosphorus. These minerals play a key role in the prevention of osteoporosis. There are steps you can take to remain healthy and active as you get older. Including a moderate amount of Brazil nuts in your diet can help prevent premature aging symptoms. These nuts can help prevent chronic illnesses that could disrupt your life and alter your lifestyle.